We left the boats behind at Spanish Bottom in Canyonlands National Park. 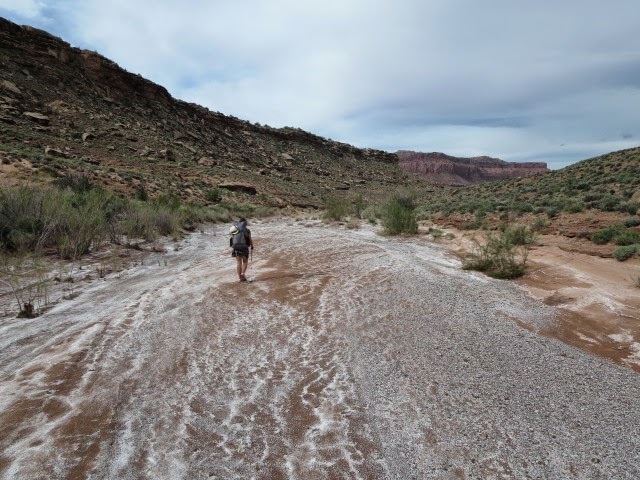 Our plan was to hike on for 4-5 days roughly westward through desert and sandstone country to a highway where we aimed to hitchhike into the small town of Hanksville for supplies. From Spanish Bottom to the Dolls House, over Ernie’s Flats past the Fins up Sweet Alice Canyon to Lou’s Spring. Climb the Golden Stair – past ‘Mother and Child’ Rock – over a plateau to the Flint Road. Down into Happy Canyon, through the narrows to cross the Dirty Devil river, then up to Poison Spring Canyon to the highway. We had a nice relaxed morning beside the Colorado sorting the gear out in the shade. Our pick up boat arrived around 12.30 from Moab and they made short work of pulling our kayaks onto the boat and taking our kayak rental gear, toilet(!) and garbage bag away with them. Soon we were alone, just us and our backpacks. It got hot (high 20’s C) and we were motivated to camp at a water supply 12 miles away so we set off quickly up the steep slopes above the Colorado. There was a trail to follow uphill which made the hot climb easier. We reached the Dolls House – an area of superb sandstone towers with a campsite reachable by a long dirt road, and we saw some people here. We picked up a faint trail through pinyon juniper out onto Main Flat, a sandy plain surrounded by pink pinnacles. The sand made for tough walking but we loved getting back into hiking and soaking up the views. Our route weaved it’s way through lovely rock garden scenery to near Clells Spring, which we don’t visit, but we do spot a couple of pools of water here that we could have drawn from. We are aiming for Lou’s Spring though further on which is supposed to be a good water source. After some rockier terrain we made it to the spring in late evening and were glad to find clear water in a tank fed by a dripping pipe. Martina spotted a hummingbird here. We camped on a good flat spot on top of a sandy hillock, a few hundred meters away from the spring itself. Some spots of rain but the sky cleared as it got dark around 8.30 pm. A great day! We woke at 6 am as it got light and fetched some more water from the spring before heading out with 5 liters each as we were not sure where our next water would be. 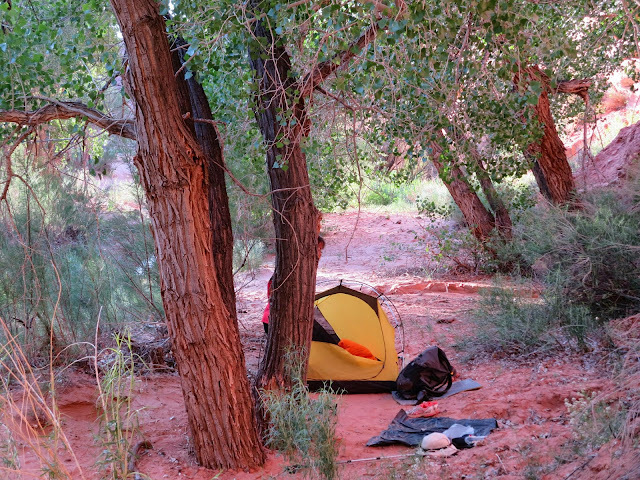 The tent is frosty but the heat soon builds up as we climbed slick rock out of the canyon and are bathed in red light from the sunrise. After crossing some jeep tracks we headed uphill through another cliff band on the Golden Stairs trail. This traverses across the cliffs finding a line of weakness up onto a higher plateau area via a neck of rock to another jeep track trailhead. Here we met Tom who is 70 and is heading out into Ernies Country (where we have just come from) for 2 days. We had a good chat and Martina in particular was delighted when he offered us bananas (the first fresh food item for 5 days!!!) and who had lots of useful info about the way ahead (himself being a desert hiker for many decades). We hiked onwards on jeep tracks with heavy loads for 2-3 miles to another climb through a cliff band of Wingate sandstone. This is a jeep track called the Flint Trail which will take us up to the higher plateau at 6,800 feet. There were people around here accessing the area by the jeep tracks and we realized that it was Easter weekend as well! Lot’s of petrified wood around, and we spotted mountain bluebirds around the pinyon juniper. Big expansive views opened out to the ‘islands in the sky’ cliff bands around. After some more jeep tracks we reached the edge of the plateau at Happy Canyon campground and searched out our route down through cliffs into Happy Canyon itself. 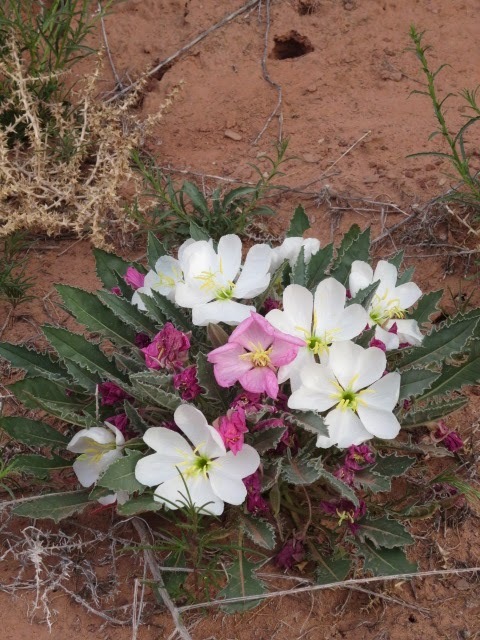 We picked up what looked like an old disused mining track zig-zagging down into colourful blue, white, bright orange and lavender bands of rock – part of the Chinle group which is also a source of minerals and uranium. This route was quite clear, if a bit bouldery in places but the drop into Happy Canyon felt like we were entering wonderful wild country with no one else around. 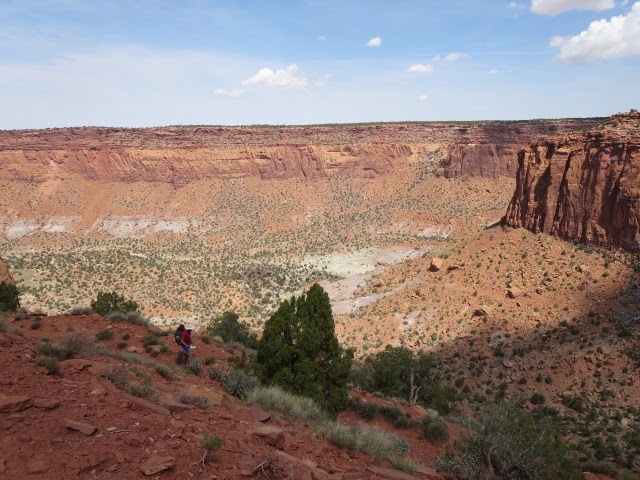 Once we dropped into the canyon bottom we just followed the sandy dry wash as it meandered downwards. 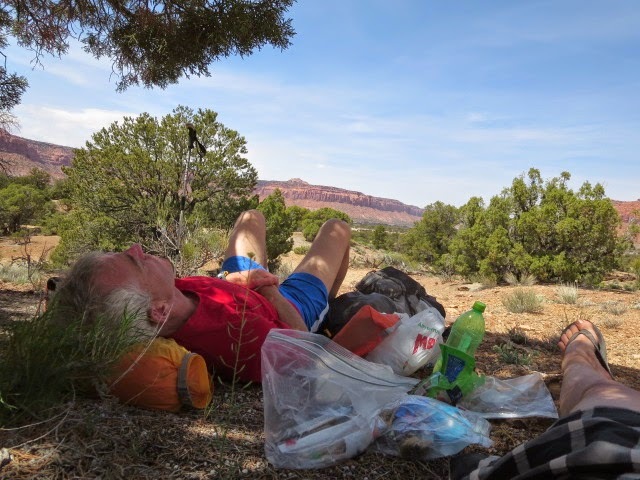 We stopped just after a prominent feature above the canyon called ‘The Hat’ (a rock tower) and found some shade under an overhang to read and rest. Brian’s feet were blistered from the hot hiking but otherwise we were holding out well and loving Happy Canyon. Alarm at 5am this morning (super early for us!) and we breakfasted in the dark. We made good pace down the south fork following the twisting dry, sandy bottom of the wash. Cheerily, we saw a number of pools of water in the slickrock along the way, although we are carrying enough for today through to our intended campsite by the Dirty Devil river and we hoped to have some pools of water in the canyon before then. We soon joined the main Happy Canyon and headed south west with a few more hummingbirds around. A fox dashed up the canyon slopes when we surprised it. This main canyon has some cool honeycombed cliffs maybe 100 feet high and still the occasional pool of water. It was dry and windy though and both of us put on headphones for the first time whilst walking and start listening to music. This worked well, no navigation was required for a few miles as we simply headed down the dry riverbed and watched the scenery change subtly as the canyon twisted along. A strong wind got up later though, at one point blasting us with swirling sharp sand grains and forcing us to take shelter- like the ‘Jibli’ in the Sahara that we have seen in the movie ‘The English Patient’! 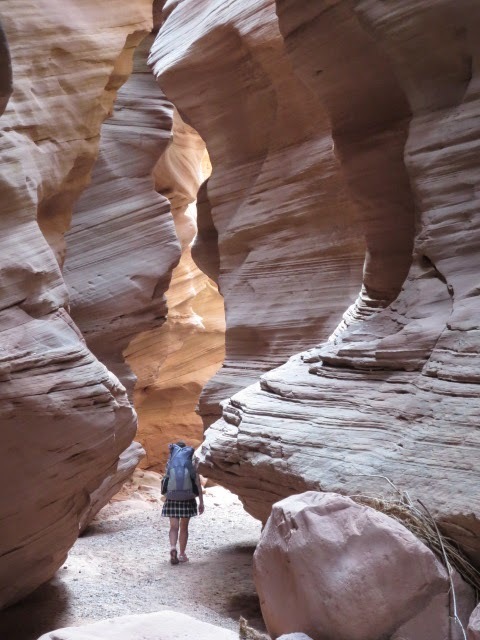 We arrived at a point where Happy descends into a narrow slot canyon in the afternoon, providing a great chance to shelter from the sandstorm. We clambered down a dryfall into the rocky slot canyon and took the opportunity to have a sheltered lunch. 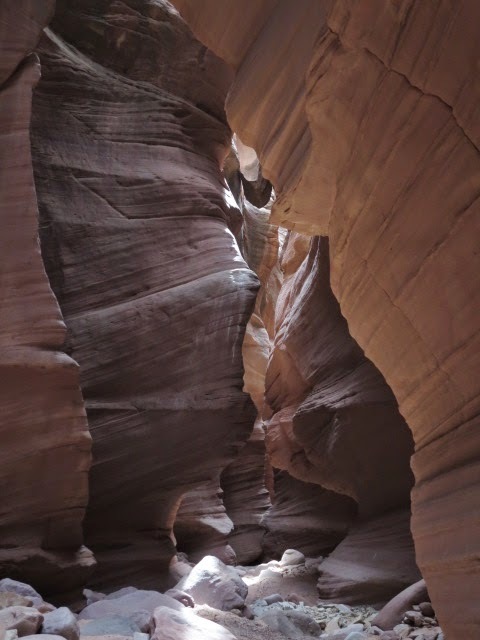 The slot canyon is wonderful, with beautifully sculpted walls, seamed with curving white layers of rock. We loved this hike with the odd scramble but too soon eventually emerge at a widening to the Dirty Devil river itself. This river can change in nature very quickly but our crossing was easily achieved in ankle deep refreshing cool water! We found a place to pitch the tent by the river but the wind was gusting hard and whipping sand finding its way into everything. The wind had thankfully died down when we woke up making things a bit more relaxed. We even managed a wash in the river before leaving at 7.20 am. Our climb out of the Dirty Devil was steep but fairly straightforward on some faint trails as we generally just kept heading up until we hit an old mining track contouring around the west side of the canyon. This was a viewful ‘balcony trail’ along the colourful Chinle rock strata and we could see back down to Happy Canyon and south along the Dirty Devil river as it makes it’s way to its confluence with the Colorado river itself. 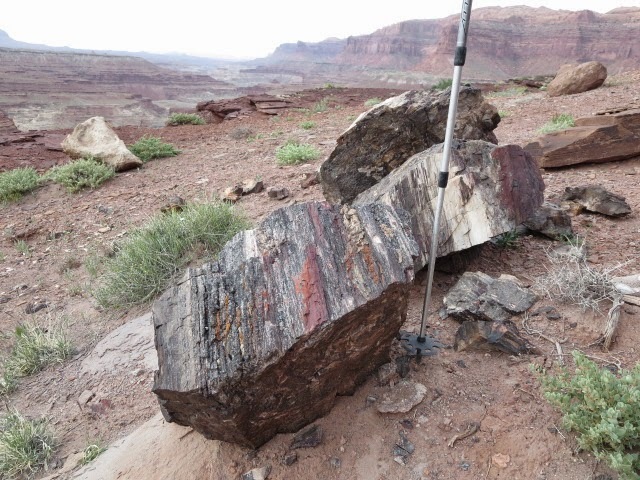 Lots of petrified wood at the side of the trail before we swung west away from the Dirty Devil to parallel Poison Spring Canyon and meet up with the actual Hayduke Trail. The wind picked up again and we took a break behind a large boulder for shelter and snacks. A jeep trail provided relaxed, easy hiking and there were seeps of water on the track. The canyon walls were now the smooth red Wingate sandstone and with lush green cottonwood trees on either side, it was very welcoming. Poison Spring was just up the track where we decide to camp in late afternoon on our 8th night out by the clear piped spring (no poison). 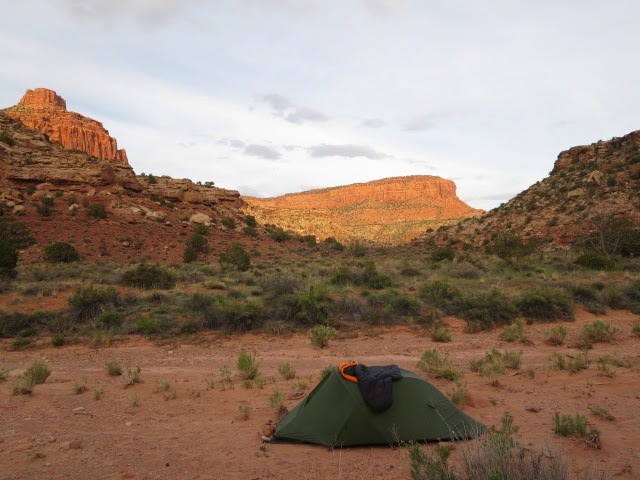 Once the tent was up we headed out for a few hours east of the canyon by scrambling up slabs and broken rock onto the plateau for some grand distant views both back east to Canyonlands National Park and west to the snow capped Henry mountains where we are heading next! 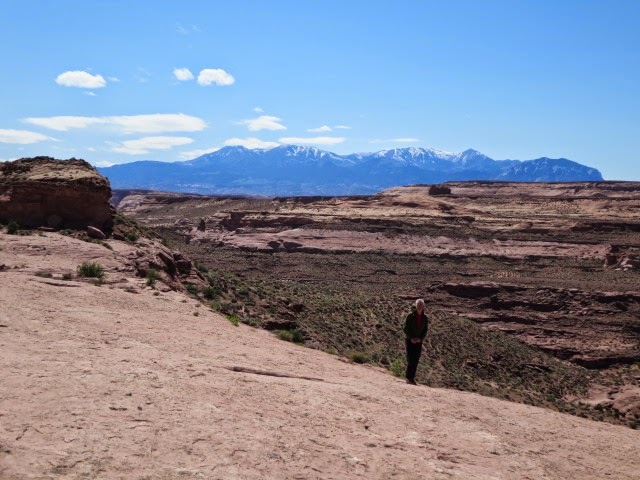 We reached a canyon overlook and disturbed some swifts – a grand wander! Today we headed for town for some food and a clean – yay! The highway was about 10 miles away and we started with a sandy jeep road. 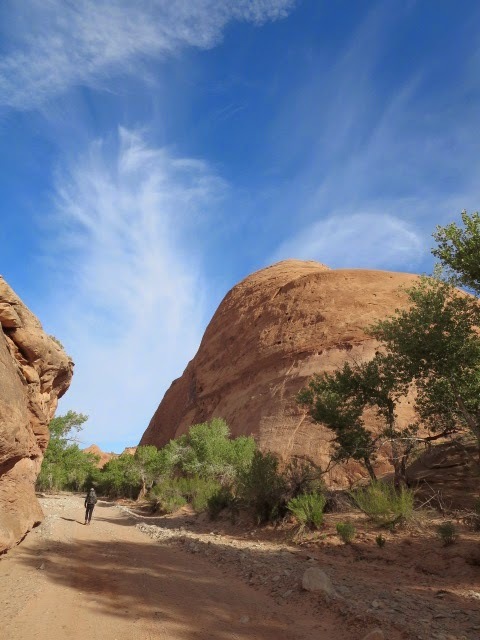 It made for pleasant hiking with more green cottonwoods and smooth Wingate sandstone walls changing to the blonde Navajo sandstone further on, higher up. We hiked quickly in the cool morning air and made it to Highway 95 by about 11 am with wide vistas ahead to the Henry mountains. 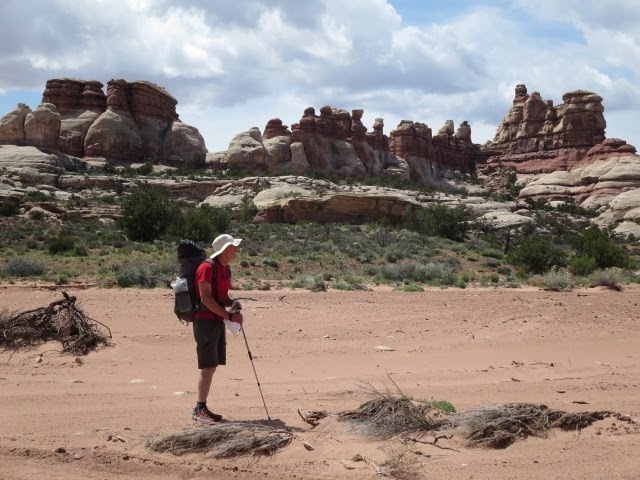 Got a lift to Hanksville from the 3rd car passing after about 15 minutes – hikers from Steamboat Springs Colorado who have been in hiking at Salt Creek canyon in Canyonlands National Park. Hanksville is a small place which you would imagine that tumbleweed is invented for, but it has motels, diners, a post office and a small grocery- all we needed! Hanksville post office – we collect our supplies! Looking forward to the 127 hours reenactment shots!